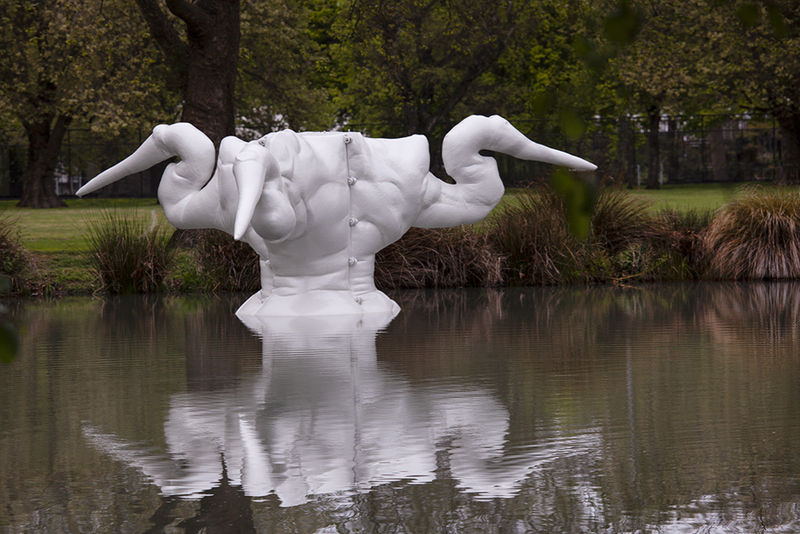 Images courtesy of the artist and SCAPE Public Art. Photo by Heather Milne. 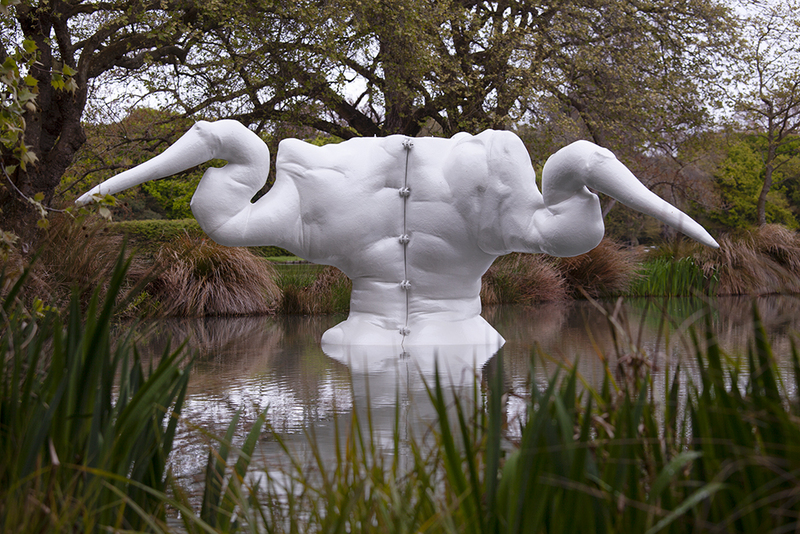 Caroline Rothwell’s Kotuku is a 2-tonne fibreglass sculpture, which depicts a three-headed kotuku (white heron, native to New Zealand). 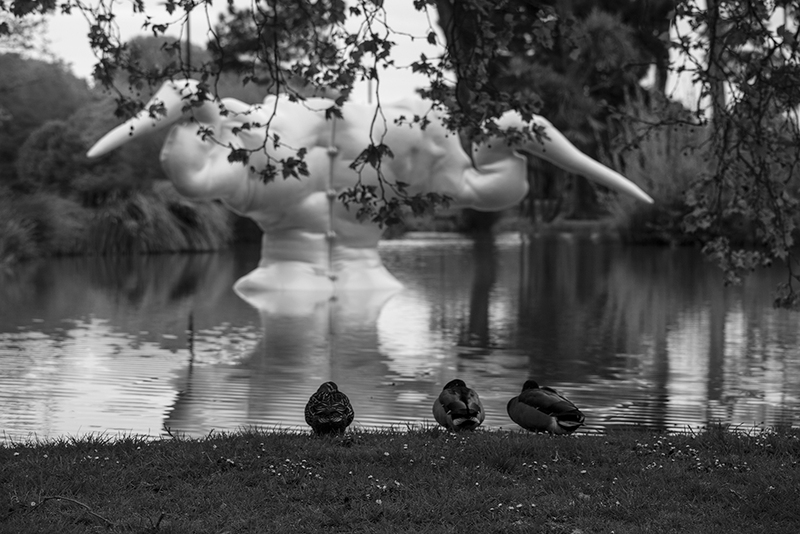 Part of SCAPE2, 2002, curated by Lara Strongman, Kotuku was Caroline Rothwell’s first work in Christchurch, and her first large-scale work. 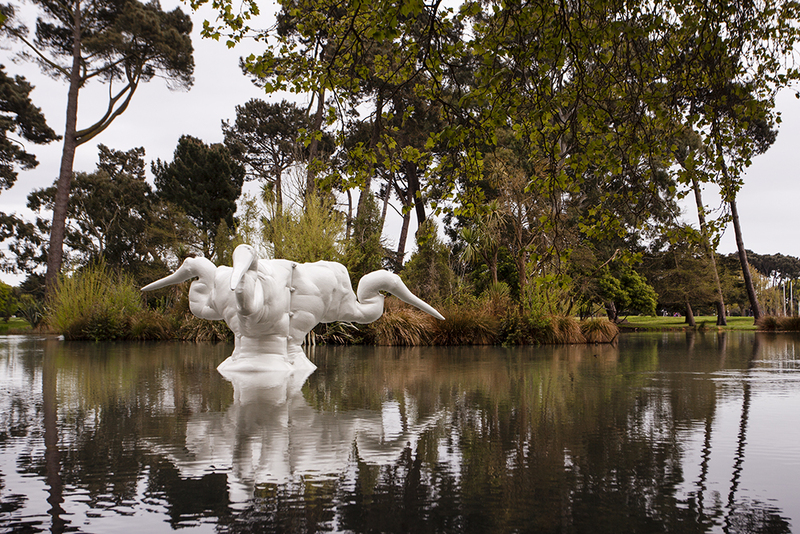 It was designed specifically for installation in a large pond in the Christchurch Botanic Gardens, and floated there until 2003 when it was moved to the Isaac Conservation and Wildlife Trust site. The kotuku (white heron) can be found in Aotearoa, Australia and Asia, but in Aotearoa it is very rare and only breeds at the Waitangiroto Nature Reserve on the West Coast of the South Island. Born in Hull, Caroline Rothwell studied at the University of Arts London in the 1990s and is based between Sydney and London. Recent projects include: Falling Suspended, Roslyn Oxley9 Gallery; inSPIRACJE 2017 International Arts Festival, Poland; Antipodes: cut apart at Museum of Archaeology and Anthropology, University of Cambridge, UK (2016); Frágil, XIII Biennale of Cuenca, Ecuador (2016); Composer, wind turbine/sculpture commission for Museum of Contemporary Art Australia (2016); Habit, Temple Contemporary, Philadelphia (2015), Dark Heart: 2014 Biennial of Australian Art at Art Gallery of South Australia; Urpflanze Street Plants, Santos Museum of Economic Botany, South Australia (2014); OMI International Arts Centre residency, New York (2014); Dispersed at The Economist Plaza, London commissioned by Contemporary Art Society.